Normally I love using my experience from 12 years of managing garden centres, to tell you what to buy. However this bank holiday weekend, i'm going to give you some hints and tips about what to avoid, to save you money and heartache when they fail. So first for those wanting to do container gardening, I'd suggest avoiding these dark stone pots. Although they are very stylish, and look great with a specimen bay tree or box ball in them, unfortunately the dark colour attracts heat, and in my experience, the roots of whatever is in them fries whenever we have a sunny day. Light coloured terracotta, seems to be much better at keeping specimen plants in healthy condition, and when you've bought an expensive specimen plant, you don't want to replace it every few months. With the surge in popularity in growing your own, the garden centres are stuffed with vegetable and herb plants. I'm all for trying to grow your own salad, and have often cheated by buying plants rather than growing from seed, particularly if i've missed the sowing time, but radishes? A pack of radish seeds is less than £2, and they are so easy to grow, it's always the first thing I try with children at school gardening club. - plus the fact that they need to be thinned, means that this pack is going to make a bunch of radishes cost £3.49 rather than a few pence. Sweet peas, - What could be better for summer cut flowers and scent? But beware, Sweet peas have deep roots, and need lots of water. If you are going to put them in a planter, don't be tempted by one of the shallow wigwams, plant them in a deep chimney pot. With long lasting scented flowers, it's easy to see the attraction of these plants. But this table of cheap plants have been grown in Italy. Apart from the air miles to get them here, this means that the plants have been grown on a lot faster than the English nurseries can produce them. - This makes them cheaper, but it does mean that if we have a frost over the next few weeks, these plants are likely to be a lot more stressed than anything that has been grown in this country. We have some wonderful herb nurseries here in the South of England, so for Lavenders and Rosemary that will last through our winters, I suggest you buy British. What have you bought that seemed like a good idea at the time? We've just been for a walk to our local bluebell wood at Hatchlands. 1) - Don't count on a particular variety of plant being out for an anniversary. - Last year it was the 11th May that the bluebells were in full bloom, - this year, it's the 24th April, and the hot dry weather has speeded up their flowering, by 3 weeks on last year. - If you take that into a garden border design you are unlikely to get the same Rose, Tulip,Geranium or Iris to be flowering at the same time every year. - A mixture of slightly different varieties of the same thing, will get you a wider flowering span. 2) - One or 2 plants combined (in the bluebell woods, this was Hyacinthoides non scripta and Ferns) can look Stunning. - BUT only for a short space of time. - Think most Chelsea flower show gardens. 3) It takes time, to create a garden, or in this case a woodland. The most stunning displays are never in the first couple of years and a garden needs to develop. The more plants you put in, the quicker it will get there, but patience is a virtue in gardening. I've had a fantastic weekend break in Normandy France. On the way back today I've been whizzing past orchards of apple trees, and glimpsing row after row of trees in blossom, with the hope of apples to come. On getting back to my garden, - the sun has been doing its work, and what was tight buds before I left is now in full bloom. My mouth is watering with the thought of that late summer fruit, but for now i'm going to enjoy the blossom from my office window, - and not moan that i'll have to rake it all off the lawn. In the last 3 years i've written about a whole range of subjects, - all garden related in some way. Here is a reminder of some of the posts that have been read the most, or were commented on. This is a photo of the cottage garden border this week. it's 3 years today since I wrote my first post. I didn't know if i'd like the writing bit, - but I thought it would be a good idea to have a record of what I was doing. In the last 3 years i've really enjoyed sharing what I do, and what works for me, - and i've loved receiving comments from my readers, - so THANK YOU if you've stopped by and left me a comment, I really appreciate it. This week is this Blog's 3rd Birthday, - i'm pretty impressed that i've been able to write 272 posts in that time, and i'm even more impressed that there are still 1000's of things that I havn't written about. 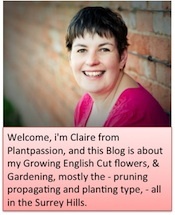 But after a suggestion from @nikkipilkington, i'm going to let you know a bit more about what I do, during my working week with Plantpassion. As a mum, my life is split into 2 halves, - School term and weekends and holidays. I usually get up between 6.45 and 7.00am - When I worked in retail there were times when I was opening garden centres at stupid early times of the day. So a seven o'clock start now is a lovely time to get up. During term time I have to deal with permission forms, Swimming kit, homework and bookbag, as well as getting a decent breakfast in me and my son, and checking on the chickens, - all before drop off. If i'm working during the holidays i've also got to work out which holiday club/ friend or relative has my son for the day and get him to the apppropriate place. I'm lucky that my school run is along rural lanes, and only takes about 5 minutes each way, - including whizzing over a usually traffic blocked A3, - so i'm normally home by 8.45, even if i've had to catch other mums to arrange play dates or school events. Then it's time to grab a coffee, and check on my emails and twitter. This half an hour is fairly important to me as it means I can fully wake up, and catch up on all the questions my clients are asking. I find out if they've received my planting plans, if they liked my recommendations for plants and gardening products, or if they've had follow up questions from my consultations or my garden guidance emails. - plus I find out what the world of gardening is doing on twitter. By 9.15, i'm usually back out of the door to my first client. I have 6 customers whose gardens I maintain on a monthly basis, so on those gardening days, i'll be going back to gardens that are my friends, that I know exactly what needs doing, and that i'm very familiar with . I'm lucky in that I can almost treat these 6 gardens as my own, as my customers trust me to do the correct pruning, weeding and propagating of the plants to get the best results each month. On other days, i'm likely to be doing some planting, some pruning, a One-to one session with someone wanting to know what's a weed and which are plants, plant sourcing at local nurseries and garden centres, or checking out a border i've worked on, to make sure that all my planting suggestions are happy and healthy in their new homes. Because I only work near to home, I'm at work by 9.30, and then I have 4 or 5 hours of gardening bliss, when I can get stuck into whatever today's project is, - only punctuated by birdsong, podcasts on my i-pod, or the occassional offer of coffee (black, no sugar) from my lovely customers. When i've cracked the weeding or pruning or planting, and sorted out the truck ready for tomorrow, I make my way home for a late lunch. This is normally just something on oatcakes, or a home grown salad. Then it's time to check out my post and emails again. I get a constant stream of suppliers magazines and emails, and I need to know all the best deals to be able to pass them on to my customers, and add them to my list of recommended suppliers. If I've done a shorter day, - or my son is on a play date or after school club, then i'll get stuck into a planting plan, or get out the drawing board so that I can finish off whatever design is top of my list. All too quickly it's pickup time, and i'm off dashing down the lane again to pick up my son. It's at this point in the day that my phone gets turned off, and I concentrate on a 7 yr old's after school needs, - piano practice, spellings, food and whatever the latest x-box game or movie is. If my husband's away on business, i'll eat my meal now, - usually the gardening has made me starving, but unfortuately it doesn't burn off as many calories as I think, so I try very hard to eat healthily (and often fail!). By 8.00pm, i've either got my son into bed, or i'm nearly there, so it's time to either collapse on the sofa and watch junk tv, or go back to the computer to finish a planting plan, download my photos from the day, and write a blog post. By the end of the week I need a glass of red wine while i'm typing. At weekends I often work on Saturday mornings, usually giving advice and consultations - so the getting up bit is very similar, but instead of the school run, I just yell upstairs at 8.45 that it's hubby's childcare time. I don't work on Sundays, - well in other people's gardens that is, - it's my garden's turn on Sunday. Does your hose do this? Does your hose reach the bottom of your garden? Unless you have nothing but wildlife gardening, and, especially if you have fruit and vegetables at the bottom of the garden, make sure the hose is long enough to reach everything. That means, so that you can spray water at the ground around the plants, not so that you can send a jet of water 20ft to the furthest point! Luckily in this garden, i've nagged enough and there's a brand new extension reel to add on, to the hose end, so that I can make sure all the veg get a good soaking. Even if you're lucky enough to have a greenhouse, i'm guessing that at this time of the year you'll be using space on your windowsills inside for growing your precious seedling. To make sure that these all grow really well, and produce you lovely healthy plants for putting out when the weather gets better, here's what I do. - Only sow the seeds at the right time. This is one that's taken me years to perfect, - the packet of Aubergine seeds says sow from January to March, so i'd sow them at new year, - then suprise suprise my germination rate (how many turn from seeds to seedlings) is pants. I've found that mostly the later you leave them the better it is. Sow thinly, so that you don't have too many seedlings competing for water and light, - and make sure that the compost is tamped down before sprinkling your seeds, so that when you water the compost level doesn't fall too far. Make sure you water them a little and often. I have a little watering can, with a rose in each room of the house that I have seedlings. Enjoy caring for your baby seedlings, so you can nurse them through April when it's oh so tempting to put them out, but you Can't! So after spending an afternoon getting my strawberries in shape for this season, here are my top 5 tips to help you get a large harvest. 1) Planting Strawberries in the ground in a mulched bed is great, but to get early Strawberries, plant some up in a pot or trough and put them in a greenhouse or conservatory, for the earliest harvest. 3) Feed those strawberry plants now, to give them the energy needed to fruit and fruit this summer. I use worm leachate, as it's free, but Seaweed fertiliser, Miracle gro, or Tomorite (when they are flowering) are equally effective. Water on your fertiliser around the base of the plant, to get it to the roots, rather than covering the leaves. 4) Water - Strawberries are thirsty, and will not fill out to full plumpness unless given lots of water. - Fine when in a border, where you can water with a can or a hose to the base, - but in a pot, they are relying on you for all their thirst quenching needs. - If you plant strawberries in a pot you can often drown the plants at the top before you've got any water reaching the bottom plants. - My suggestion is to use a grit filled plastic bottle with holes in the side as a watering vessel in the centre of the pot. (Here's one I was planting up earlier, - showing you how I position the bottle as i'm putting in the plants) Tonic water or mineral water bottles are an ideal size for this. When you water into the top of the bottle, the water is held in the grit and soaks out through the holes at all leaves, and that means that the plants at the bottom of the planter get just as much water as those at the top. 5) and finally to get as many fresh strawberries as possible, - replace the main plants every third year, using runners, or new plants from nurseries, which means that you get fresh, healthy and vigorous plants to give you the most Strawberries possible.